On October 12, 2014, 38 international researchers and historians wrote a letter (1) to the Director-General of the BBC. As its title indicates, the letter is a protest letter. The letter is written by foreign intellectuals except one I guess: Professor Josias Semujanga (2); Professeur titulaire, Département des littératures de langue française, Université de Montréal, Quebec. Intellectuals, historians, journalists and researchers, they may be; they may not well understand our history, as we Rwandese do; and especially we who were there when the genocide happened from 1990. As an educated Rwandan citizen and a survivor of genocide (3) who was in Rwanda when the genocide happened, I intend in this article, to analyze this protest letter, the more objectively as possible. I will highlight the main points of protest, ask some questions and draw conclusion. For this I give credit to the protesters. At least, now they accept and support the legitimacy to investigate any crimes committed by the RPF. I wish they have said that loudly since 1994. Maybe their voices would have convinced Americans and ICC to bring on trial the RPF members who committed crimes against humanity and genocide. Ten, twenty years back, the whole world blamed the Rwandan genocide on one part only, the Hutu part. Now it is becoming evident that the Tutsi also committed genocide. That is one of the truths the BBC is bringing out and it needs to be congratulated and applauded for this. “The BBC strongly refutes the suggestion that any part of the programme constitutes a ‘denial of the genocide against the Tutsi’. There are repeated references to the mass killings of Tutsis by Hutus in 1994 and that this constituted genocide. The programme also includes an interview with the Director of the Genocide Museum at Murambi, a Tutsi and genocide survivor, and a convicted Hutu genocidaire who spoke of his part in the killing of thousands of Tutsis. There is a truth in what the protesters are saying: far from providing viewers with untold story as the title promises, are old claims. This is true; there is nothing new the BBC is telling that has not been said since 1990. In fact, since 1990, honest intellectuals, academics, scholars, lawyers, researchers and journalists have been all the time saying that RPF committed crimes against humanity and genocide. There was always a claim that Kagame ordered the shooting down of President Habyarimana’s airplan. What is new is that these old claims as the protesters call it, they are now being told by respected, international well known world leader news broadcasting, the BBC. With regard to the shooting down of the Presidential airplane; what is new is the story being told openly on the camera, by the only then very close Kagame’s collaborators: General Kayumba Nyamwasa and Dr. Rudasingwa. An important question here need to be asked: The very close collaborators of Kagame at the time of the shooting down of President Habyarima’s airplane are testifying and are ready to do so before a court of law. They ascertain that Kagame organized and ordered the shooting of President Habyarimana’s airplane. Who are the protesters or what credibility can they have to contradict what General Kayumba Nyamwasa and Dr. Rudasingwa are saying? Who should we believe? The protestors? The ‘Hutu Power’ campaign does not exist. This is a pure invention of the RPF regime, intended to criminalize and diabolize all Hutus. People should not confuse the slogan the Party MDR used to use in 1993-1994 ‘MDR Power’ and the ‘Hutu Power’ campaign or ideology. This is a pure invention of RPF. MDR Power can not be equaled to Hutu Power. First because MDR did not represent all Hutus in Rwanda, secondly the MDR Power slogan was just intended to differentiate the two different wings or tendencies that emerged within the MDR Party in 1993-1994 as to how the Party should deal with the invasion of the RPF and its intention of ceasing the power in Rwanda. Today, I do not know any influential Rwandan politician in the opposition who denies the genocide committed against Tutsi. All what I know, is that all Rwandan politicians in the opposition are demanding the genocide against the Hutu committed by the RPF to be recognized too. I challenge the protesters of the letter sent to BBC, to name the Hutu politicians we know in the current Rwandan political arena who have the ‘Hutu Power’ ideology. Be it FDLR, FDU-Inkingi, RDI, Amahoro, PPR Imena, RNC, you name it; all Rwandan political parties agree on one thing: Rwanda is for all Rwandese and we shall all, Hutus, Twa and Tutsi alike live in the same country Rwanda. We are all Rwandese and there is no such ‘Hutu Power’ campaign except in the mind of RPF and foreigners such those signatories of the protest letter to BBC. They just recycle what they hear from RPF without making a proper intellectual critic and analysis. Who are you calling convicted génocidaires? General Nyamwasa? Dr. Rudasingwa? Christian Davenport? Allan Stam? Carla Del Ponte? Luc Marshal, and other many brave writers, professors, researchers and journalists, human rights activists around the world who are telling the world what really happened in Rwanda? Convicted génocidaires, most of them are in jail and those who have been released after they completed their sentence, do not only have the means to campaign but also do not have the freedom to travel wherever they want to. How can you dare think that those convicted génocidaires are behind or at the heart of this campaign…? Do you really think, that convicted génocidaires or their defence lawyers from ICTR have the power and the capacity to bribe or to influence a world leading broadcasting Institution like BBC? Do you take a minute to ask yourselves why it is so today and it couldn’t be like that 10 years ago? Why do you want us Rwandese and the world to swallow the only RPF’s version of the Rwandan genocide as a biblical doctrine, or as the only truth? I think there is nothing wrong when another version of the story creates a doubt. This could be rather for intellectuals, researchers and historians you are, a motivation to deep further your research in finding the truth or in questioning what you thought was the only truth. 3. An effort to place the blame for shooting down President Habyarimana’s plane on April 6, 1994 on the Rwandan Patriotic Front (RPF). We will analyze those claims one by one. Once again the fabricated word ‘Hutu Power militia’. The MRND Party, like the other Political Parties had youth wings. Interahamwe used to be MRND’s youth wing that unfortunately radicalized themselves to a militia as millions of refugees from RPF controlled territory started to come in Kigali reporting atrocities and crimes committed by RPF. Interahamwe were MRND youth wing and not Hutu militia because all Hutu did not belong to Interahamwe. In Interahamwe you would find Hutu as well as Tutsi. Surprisingly Interahamwe Chief at the National lever was a Tutsi (Robert Kajuga). The majority of Interahamwe were of course Hutu. That is normal as Hutu are majority in Rwanda. If the number of Interahamwe militia was estimated at 30 000 people. And every body knows that the majority of Tutsi who were killed by Interahamwe; why does the RPF vehicles this ideology that all Hutu are génocidaires, and all Hutu must apologize? 30 000 Interahamwe militia they do not even represent 0.5% of the population at the time of genocide. In 1993 according to International Monetary Fund-2011 World Economic Outlook (5), the population of Rwanda was 7 609 000. No body has the truth as to what exact percentage of the 30 000 Interahamwe killed the Tutsi as no body made this census. Or what we know is that not all Interahamwe killed the Tutsi. Whatever number of Interahamwe killed the Tutsi, this could not be the issue. The truth remains that Interahamwe killed the Tutsi and within Interahamwe there were Tutsi. The only objection we strongly make is to equal Interahamwe or those who killed the Tutsi to all Hutu or to insinuate the existence of a so called ‘Hutu Power’ who wanted or who wants to exterminate the Tutsi. Let us allow the figures and not sentiments speak by themselves. In 1960 the population of Rwanda was estimated to 2.9 millions (6). From the colonial time; at the time our parents and grand parents were having what they used to call “amabuku” meaning the books -an old identity cart in which the colonial time mentioned the ethnicity identity of each Rwandese- Hutu were estimated at 85%, Tutsi at 14% and Twa at 1%. This means that in 1960, the Hutu were 2 465 000, Tutsi were 406.000 and Twa were 29 000. By 1965 an estimated number of 130 000 Tutsi (approximately one third of all Tutsi) are said to have fled to the neighboring countries (8) leaving only 276 000 Tutsi in Rwanda which represent 10% of the whole population. From Rwanda Government sources, we are told that: “A systematic count by the government of Rwanda in collaboration with genocide survivor organizations established that 1,074,017 people were killed, of whom 934,218 have been identified by name: 93.6% were killed because they were Tutsis; the others either because they were Hutus married to Tutsis, resembled Tutsis, had hidden their Tutsi neighbours or were Hutus who opposed genocide.” (11) Those figures were released by the Government of Rwanda in February 2002 as the result of the census that aimed to establish the number of people who were killed during the period 1990-1994. Simple logic and simple mathematics oblige: If 1 074 017 people died in Rwanda during the 1994 genocide and Ibuka (a Tutsi genocide survivor organizations) and the Government of Rwanda estimate the number of Tutsi who survived the genocide to 300 000; who are the remaining 774 017? I leave the reader of this article to answer this question him/herself. There is no doubt about it, according to research results and the statistics available at the moment, Tutsi who died during the 1994 genocide were about 380 00 and the Hutu were about approximately 690 000. In other words the number of Hutu who died during the 1994 genocide was almost the double the number of Tutsi who died. Why is the number of Tutsi or Hutu who died so important? If the real number of Hutu who died during the 1990-1994 genocide is to be known and more importantly is bigger than the number of Tutsi who died, this would be enough element to prove that RPF rebel forces killed Hutu because Interahamwe militia and or the Rwanda Government Army could not have killed their own majority ethnic group Hutu in a such big number. No one, no academic, no historian, no researchers, no government will ever know with certainty the exact number of Hutu and Tutsi who died during the 1990-1994 genocide. All figures advanced will be hypothetical and some people depending on the interest they want to defend or the ideology they want to vehicle will always argue until Jesus-Christ returns. However if all agree to accept the estimate, based on my calculations, I estimate that Hutu died in much bigger number than Tutsi. But number of who died is not what matter most to us Rwandans. What matter more to us is justice for all. 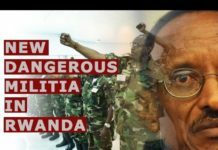 What we know as Rwandese who seek the truth and justice for all, is that genocide and crimes against humanity has been committed by both sides as well as RPF rebel army and the Interahamwe militia and some elements of the army and other individuals who have been convicted and some others who got away with. It is therefore a sign of courage and some thing to support when a world leading news broadcasting like BBC brings to the attention of the world the crimes committed by President Kagame and the RPF. We discussed this issue earlier above. If the former very close collaborators of Kagame, affirm and testify that Kagame planned and ordered the shooting down of President Habyarimana’s airplan, who are the protesters to claim the contrary? The BBC film “Rwanda Untold Story” as the title indicates is mainly meant to tell the untold story. The RPF version story and expert’s stories that comfort RPF version is not the only story, BBC wanted to tell the world the untold story. And it did it brilliantly! We need also to mention that the Habyarimana regime and the Gevernment’s Army were so infiltrated by RPF elements at high level that one can not say that it would have been impossible for the RPF to penetrate the Kanombe military camp with a missile. RPF was able to do every thing including shooting the President Habyarimana’s airplane whenever the shooting originated. The genocide was not planned let alone mentioning it was carefully planned. If that was so, no single Tutsi would have left in Rwanda. The creation of Interahamwe militia was meant to defend civilians when the arm forces were on the battle ground field. Unfortunately it turned out that when the President airplane was shoot down, no institution no leader no politician could not control Interahamwe. We however recognize that there was very little effort or none on the part of the Government to control Interahamwe. Lt-General Roméo Dallaire opinion can not be considered as authority on the subject of genocide in Rwanda. Dallaire’s opinion is one among others and do not deserve the authority the protesters claim. Should a proper investigation done in the way Lt-Roméo Dallaire conducted his mission in Rwanda, we will not be surprised of his complicity with the RPF rebels. I will say the protesters’ accusation to BBC is false and baseless. Throughout the document BBC has never denied the genocide that happened in Rwanda, the BBC is telling what hasn’t been told in the Rwanda genocide story. I am myself a genocide survivor, I don’t see any offence to me, when a journalist or a researcher bring to the open, other facts, other truth of what really happened in our genocide history. They will be no reconciliation in Rwanda unless the truth and the whole truth of what really happened during the genocide in Rwanda is known and told and all perpetrators hutu and tutsi alike are brought to justice or demand forgiveness. The BBC documentary is contributing to that. When the protesters say “the 1994 genocide of Tutsi”; they say the half truth and they are lacking intellectual honesty and rigour. The whole truth is that the genocide that happened in Rwanda was not only “the genocide of Tutsi” but the genocide of Hutu too. Without in anyway denying the genocide committed against the Tutsi, the BBC documentary has the credit to tell the world the other half of the truth, the genocide committed by RPF against the Hutu. This conclusion is the protesters’ opinion. It is not the only one opinion. The other opinion, including mine; is that: Rwanda’s Untold Story is a courageous journalistic act of investigation that poses critical questions in what the conqueror (RPF) and its allies want the world to swallow as the only truth without the right of questioning all the cover up in the Rwandese tragedy. The BBC documentary may have caused offence to some victims and survivors of the 1994 genocide in Rwanda for what they believe to have happened. The protesters letter need to know that for what we believe and know happened in the 1994 genocide, to some other victims and survivors of the 1994 genocide in Rwanda, including myself, the BBC documentary has not caused any offence, on the contrary. Therefore, the BBC should not apologize to any one for its journalistic work. Simply put, for various reasons, the BBC documentary Rwanda’s Untold Story, some like it and others do not like it. None of those who like or who do not like has the right nor the authority to dictate to BBC how to carry out his job. Prof. Linda Melvern, Senator Roméo Dallaire, Prof. Gregory H. Stanton, Mehdi Ba, Bishop Ken Bahram, Dr. Margaret Braerly, Dr. Gerald Caplan, Prof. Frank Chalk, Dr. Phil Clark, Boubacar Moris Diop, Jean François Dupaquier, Hélène Dumas, Prof. Margee Ensign, Tim Gallimore, Peter Greaves, Fred Grunfeld, Dr. Helen Hintjens, Dr. Geogina Holmes, Richard Johnson, Eric Joyce, Amb. Karel Kovanda, Françoise Lemagnen, Amb. Stephen Lewis, W. Alan McClue, Roland Moerland, George Monibio, Jacques Morel, Barbara Mulvaney, Dr. Jude Murison, Peter Raymont, Prof. Josias, Semujanga, Jonathan Salt, Keith Somerville, Patrick de Saint-Exupéry, Dr. James M. Smith, Rafiki Ubaldo, Andrew Wallis and Lillian Wong ; are defending the undefendable ? 1. Did the RPF and Uganda invaded a sovereign State in 1990? 2. Did the RPF commit war crimes and crimes against humanity during the 1990-1994 war and after? 3. Did the RPF and Kagame regime mass murder thousands of refugees protected by UN forces in the Kibeho camps in Rwanda? 4. Did the RPF and Kagame regime mass murder thousands of refugees protected by UNHCR in the Democratic Republic of Congo Refugee Camps? 5. Did the RPF and Kagame regime proxy launched wars in DR Congo that killed millions of civilians? If your answers to all the five questions are Yes, You have a A+. But if you have answered No to any of above questions, you have an intellectual disability and you need an academic treatment. The recent debate (12) and controversy on the BBC Documentary Rwanda Untold Story, is a healthy debate that should motivate intellectual, journalists, historians and researchers to revisit their previous hypothesis in search of further facts and truth. Be ready, more chocking revelations will be soon coming out as to who shoot the President Habyarimana’s airplan. We still want to know why a country like Burundi 20 years after, never investigated or failed to bring to justice people who killed their President Cyprien Ntanryamira who was assassinated together with President Habyarimana on April 6, 1994. We still want to know why, the UN Security Council and countries who claim to be the champion of democracy and human rights like UK and USA are protecting the President some regard today as the worst criminal on power the world has ever known after Hitler. We support encourage and call upon serious news broadcasting Organizations like BBC to help us answer those questions. By so doing, you are contributing to the real reconciliation of all Rwandese People what will happen only through telling the truth, only the truth and the whole truth. A freedom fighter: My gun is my pen, my ammunitions are my ideas. 2. By name he could be a Rwandese or a Burundi national. If there is other Rwandese who changed their names to look like Western Europe or North American names and are among the signatories, I apologize it is not intentionally. 5. International Monetary Fund – 2011 World Economic Outlook: http://www.indexmundi.com/rwanda/population.html . In 1993 according to International Monetary Fund-2011 World Economic Outlook , the population of Rwanda was 7 609 000. 8. Crowder, edited by Michall (1984). The Cambridge history of Africa : volume 8, Cambridge University Press.